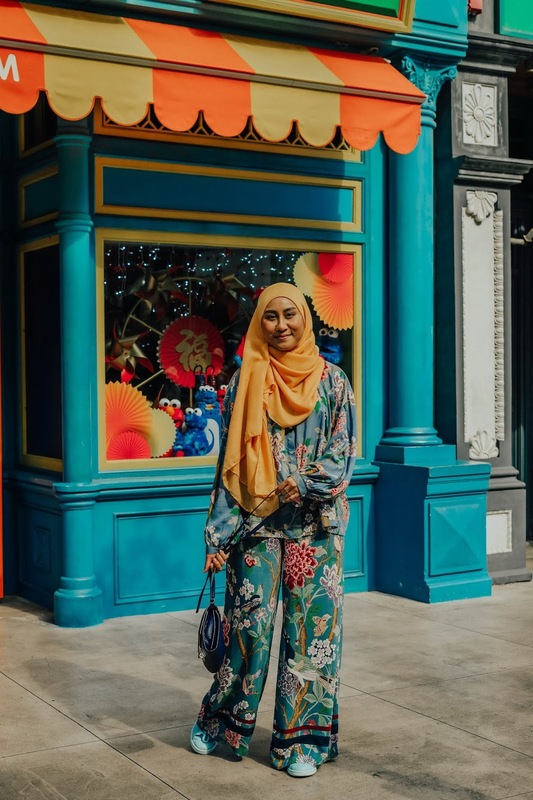 The thing I love about this darling set from the resulting collaboration between GP &J Baker and H&M is it feels cool and airy on, which made it the ideal choice for my hot day outdoors at the Universal Studios Singapore theme park — on my birthday trip, no less. 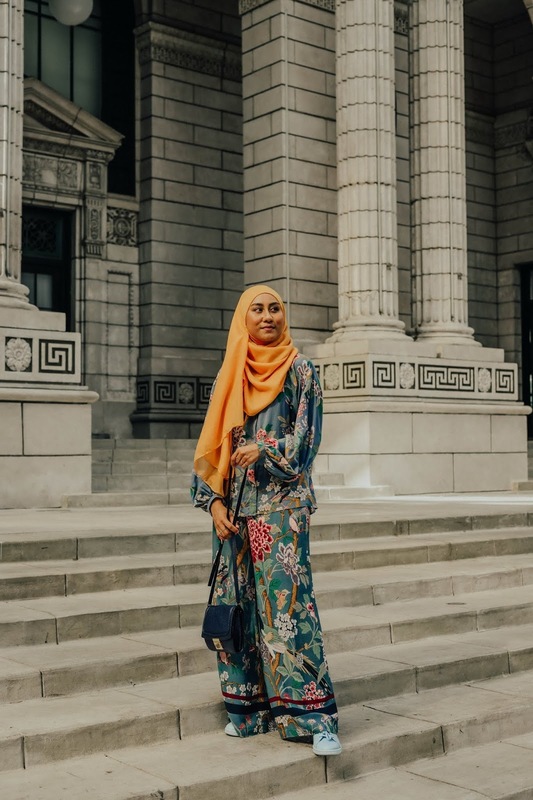 I'm all for clashing colours but it's just easy finding one accent colour in a colourful print and wearing a hijab in that colour. 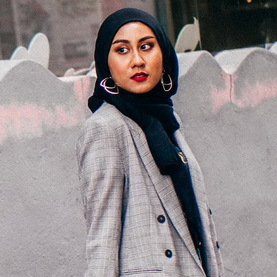 It might be easier to just put on a scarf in the same colour as the background of the print but uhhh guys can you imagine me in head-to-toe teal blue? Not sure how flattering that would look on me...or perhaps it'd be a lewk, who knows? I loved pairing the red scarf with the floral set at Burano. I also believed in repeating clothing items over and over again. But I'm not for one to repeat the same exact ensemble — especially not when one is in Singapore and want to shoot fun outfits while at it! 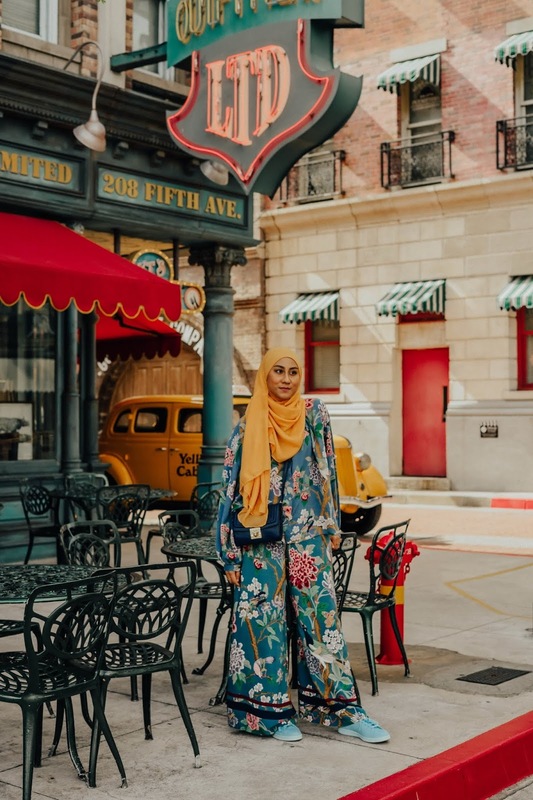 — so I picked a yellow hijab this time as it was the second colour that stood out out of the many shades in the print. After looking at the resulting photos, I decided yellow was even better than red for the occasion, even though back in Italy I thought no other colour but red could complement the print! Just goes to show, you never know until you try, right? Besides, the vibrant yellow made me feel truly like the "birthday gal" that I was. PS: Technically this day wasn't my birthday per se but hey I would celebrate my birthday the whole month if I could! 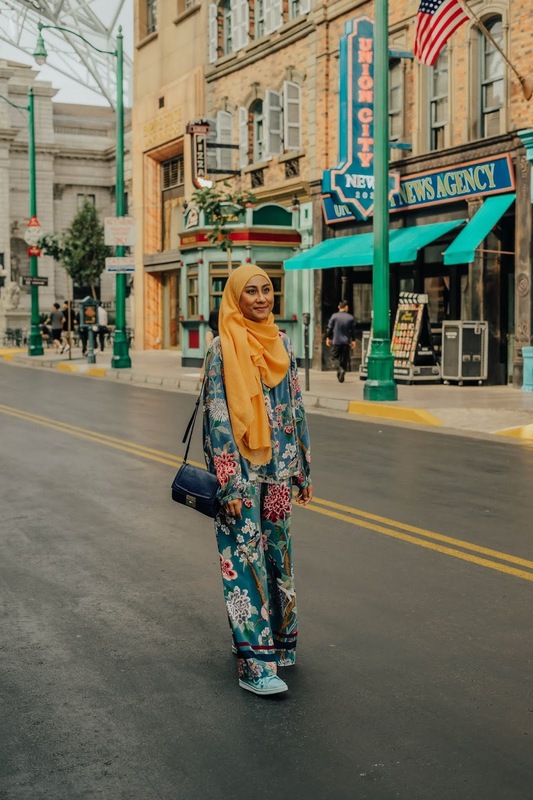 Universal Studios Singapore was so much fun, by the way! I'm all about trying out roller coasters, no matter how many times I've muttered "What am I thinking! What are you doing Liyana!" minutes before stepping into one, as I heard the screams of riders while waiting in line. USS had some incredible exciting ones, especially the two Battlestar Galactica rides. 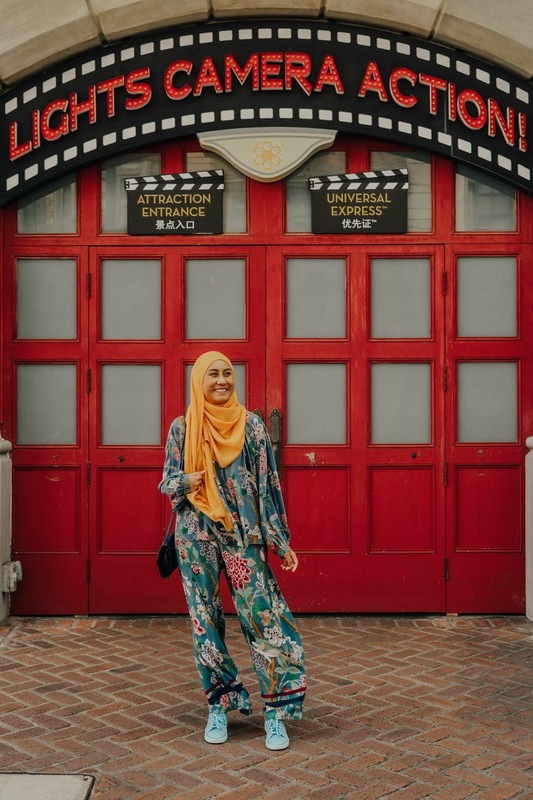 The problem is, now I think the floral print blouse and pants go so well with red and yellow, I'm worried it would be slightly challenging to find another colour to pair them with that I would like as much! Although...who says I need to choose on a set of colours and be done with it, right? Just like how this yellow scarf proved: experimenting pays off. Perhaps sage green, navy blue, or even mauve purple (all hues are in the print!) would work next time? 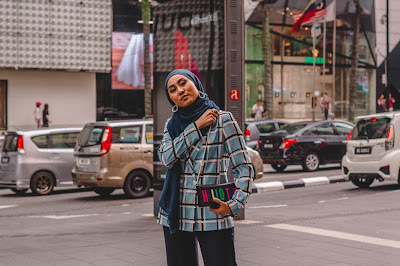 Did you like my red or yellow hijab more with this GP &J Baker x H&M matching set? 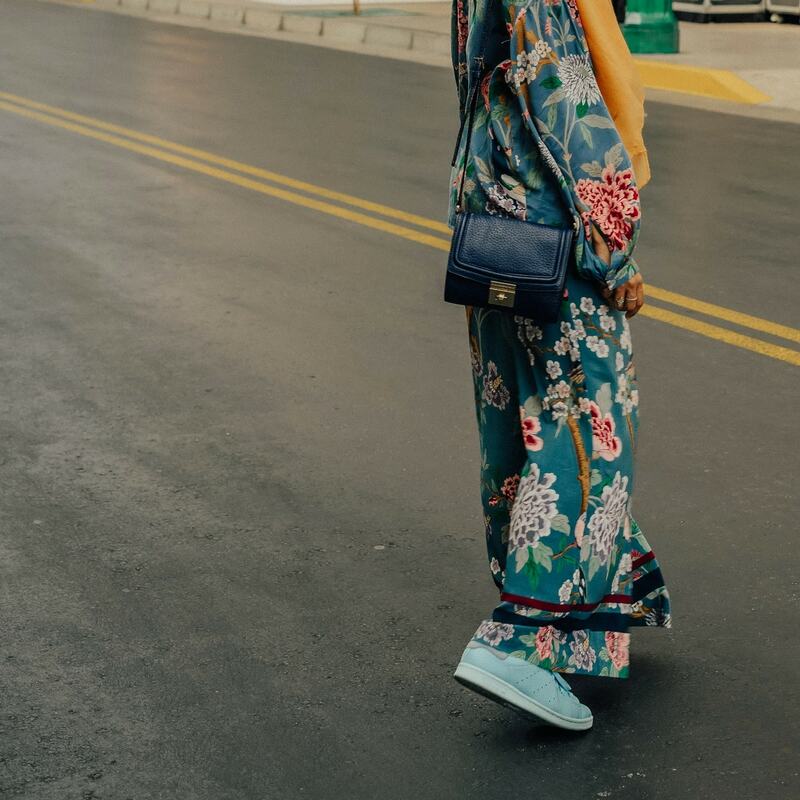 What shade of scarf would you have matched this floral print blouse + pants with? 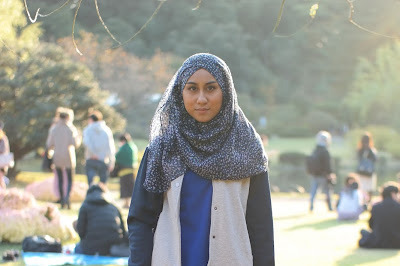 I love my own scarves and am convinced that they can elevate any top and bottom into a far more pulled together look. Although mine are worn only around my neck they provide a lot of style impact. 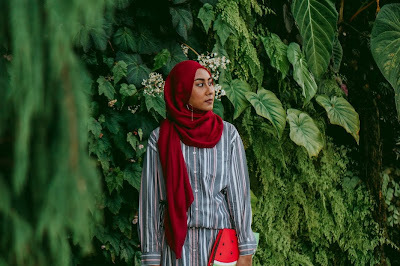 I think your hijab may have a slightly bigger impact because it covers more of you and is a lovely, colorful, focal point, highlighting your face and beautiful eyes! 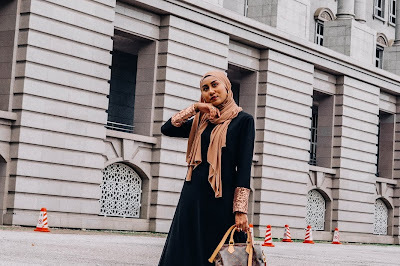 I love looking at outfits with scarves around the neck too, they give me hijab ideas as well. Weirdly there aren't that many photos of street-stylers wearing scarves nowadays, even in winters...? Every winter Shah and I spent overseas, we were armed with a bunch of scarves - they're such a necessity. If it is indeed because it's "not trendy", how these people go around in the subzero temps with their necks cold, I cannot understand, especially for the sake of "fashion"! I don't own any suede scarf but yes, a brown one could work, I have a few of those! Similar to the earthy colour of the "branches" in the print, I presume.